For the second year running, artists will bring their easels, canvases, and paints and take to the streets of Cardiff to create unique works in an alfresco event. Last year’s successful event attracted thousands of people, artists, and musicians to entertain them. The 2018 Cardiff Alfresco weekend will take place on September 28th to the 30th in The Hayes. 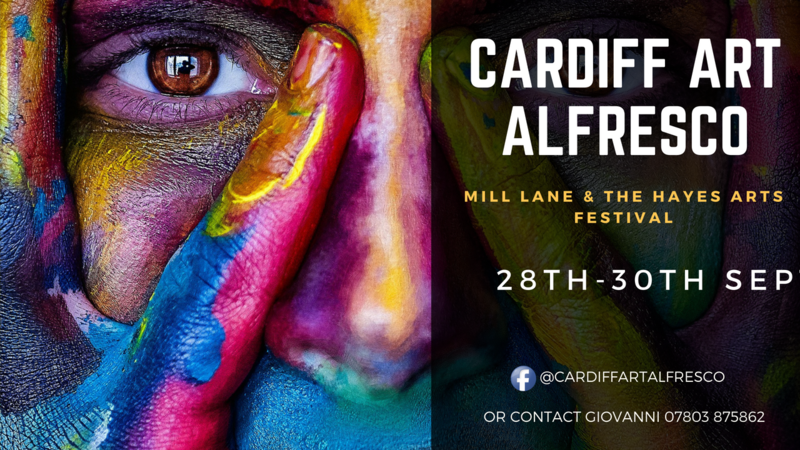 The brainchild of Cardiff’s most high-profile businessman, Giovanni Malacrino, the event is aimed at putting the city on the cultural map and supporting local artists. The restaurateur and experienced businessman was the pioneer who established the first café quarter in the UK in Cardiff 25 years ago. His restaurant, Giovanni’s On The Hayes, is also celebrating its 35th birthday on October 28th with a charity cabaret dinner at The Marriott Hotel. Giovanni is a long-term supporter of the arts in Wales and his aim is to complete the transformation of Mill Lane café quarter and bring in more artists to paint and entertain.With that in mind, last year he opened a new arts hub in Mill Lane, GCHQ (Gios Creative Hub Quarter).The arts hub hosts exhibitions of work by Welsh artists as well as providing a performance and recording space for Welsh musicians, as well as providing a meeting place for food aficionados and bloggers. In the event of rain, Giovanni has organised for large parasols to be available under which the artists can paint.There will also be a stage near Giovanni’s restaurant in The Hayes where musicians will entertain the artists and crowds of visitors.